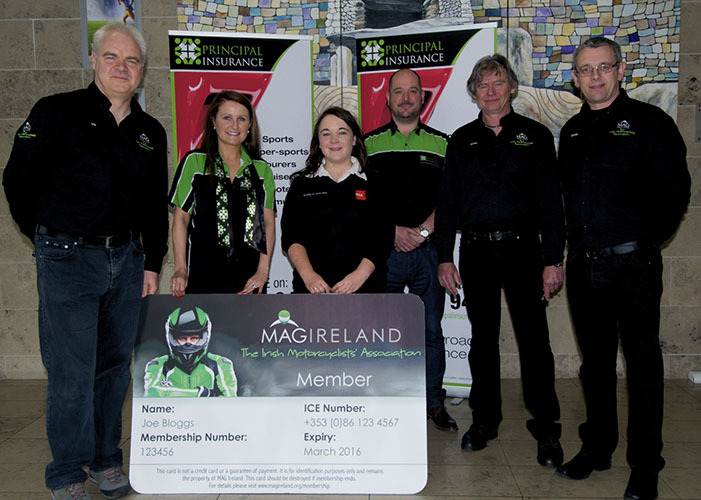 Our friends at MAG Ireland – The Irish Motorcyclists’ Association – have launched their new membership card to include an ICE number. Their new plastic credit card style membership card includes all pertinent membership information plus a unique and simple addition – An ICE (In Case of Emergency) number. The ICE Number programme enables first responders such as paramedics, fire fighters and Gardaí, as well as hospital staff, to contact next of kin and obtain important medical information in the event of a serious road accident. This information can be crucial in an emergency situation and all MAG Ireland members are asked to support this unique initiative by carrying the new membership card in clear ID pockets located on many hi-viz jackets or in the riders wallet. Speaking at the launch, MAG Ireland P.R.O. 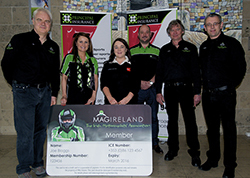 Victor Donnelly said: “As a not for profit motorcyclists’ association MAG Ireland depends greatly on the goodwill of sponsors to alleviate the costs associated with launching such initiatives. In this instance we are delighted to be supported by Principal Insurance who kindly donated the equipment that has enabled us to be at this point today”. Aly Dixon, who leads Principal Insurance in Dublin said: “When Principal Insurance were approached by MAG Ireland we knew we had to support this project and with it the wellbeing of Irish motorcyclists. As the newest player in Ireland’s motorcycle insurance market we are delighted to support this initiative and will monitor it’s success here with a view to migrating the idea to the UK”. Bartlett went on to explain: “An ICE number cannot be your own personal phone number, instead it must be that of a close relative or friend who is familiar with your current medical condition”. Paramedic Nick Coward and Emergency Care Practitioner Rodge Byrne of of First Bike on Scene – Emergency Response Skills programme B.I.K.E.R.S. training highlight the following: “In case of emergency (ICE) is a system that allows first responders, such as paramedics, firefighters or police officers to contact the holders nominated person to obtain important medical or support information. Northern Ireland riders can get “covered” and use their head in case of emergencies with the Biker NI Safety (CRASH) Card. 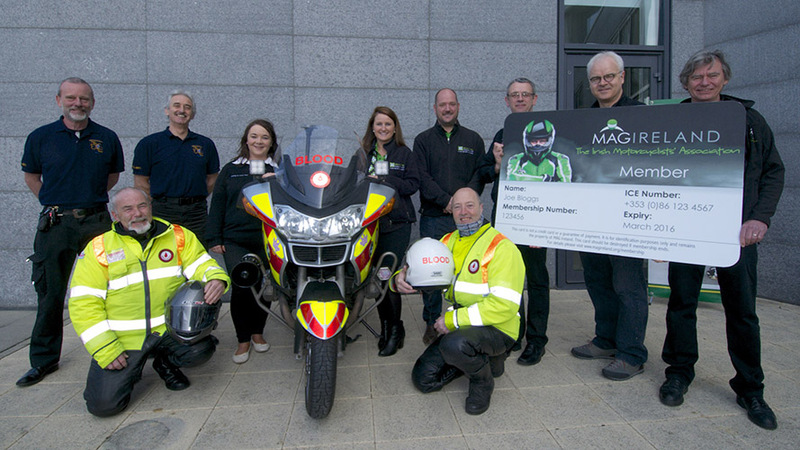 Supported by the major agencies involved in keeping us safe on the road: PSNI Bikesafe – Northern Ireland Ambulance Service (NIAS) – Northern Ireland Fire & Rescue Service (NIFRS). 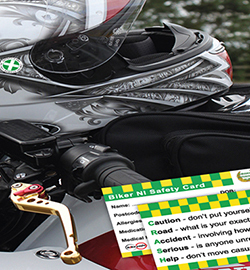 Motorcyclists are provided free of charge with a card, which is place inside their helmet as a medical alert, details which the rider has written on the card provides vital information for attending ambulance crews or emergency responders if the motorcyclist is injured in a road traffic collision or unable to talk coherently because of concussion or having been knocked out. 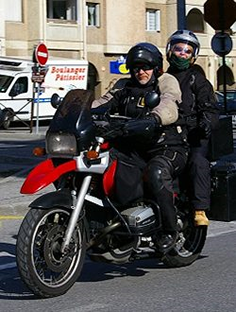 To let those attending know about this vital information the rider places a sticker on the outside of the helmet, on the right hand side, indicating that a rider or pillion is carrying a safety card inside the lining of their helmet.